Vacuum Pump Market USA « Global Market Insights, Inc. In an era where harmful emission reduction is being continuously propagated, the vacuum pump market trend is set to undergo a consequential transformation in the years to come. The changed merchandizing spectrum of the business space is aptly validated through a recent instance, when Leybold GmbH, a part of the Swedish Industry Group, Atlas Copco, unveiled its latest VARODRY vacuum pump series. This newly launched dry vacuum pump range that has been brought forth by the giant at this year’s ACHEMA, is claimed to be incorporated with an emission free ventilation. Allegedly, since this vacuum pump is absolutely oil-free and dry, it avoids any type of oil adulteration and particle emission, making it an absolute choice for industrial applications. Leybold’s initiative sheds a positive light on the sustainability trend and the up-to-the-minute developments that vacuum pumps market is presently characterized by. This new vacuum range has already garnered rave reviews in the business space on grounds of its compact design and highly reliable performance with low capital investment and operating cost. Given the fact that it neither requires compressed air nor cooling water for its operation, handling the pump is quite easy. The pump is claimed to ensure uninterrupted operations without system downtimes. Undoubtedly, the product launch has remarkably strengthened Leybold’s stance in the vacuum pump market. Yet another instance depicting the efforts undertaken by major companies to increase the efficacy and performance level of vacuum pumps, Edwards Group Limited recently released its latest single stage rotary vane vacuum pumps, the nES EX series. According to the UK based firm, this enhanced version of rotary vane technology is specifically designed to operate in environments that are potentially explosive in nature. Apparently, this articulately designed nES EX 40-630 series is likely to amass a huge popularity in the market especially from chemical processing sector. The product which is claimed to offer safer and cleaner real-world operations is another breakthrough model underlining the innovation and development opportunities underlining the vacuum pumps market landscape. It is prudent to mention that the profitability quotient of vacuum pump industry is extensively influenced by the robust growth of chemical processing and manufacturing sectors. Estimates suggest, global chemical industry would nearly record a valuation of USD 5.5 trillion by 2025. Chemical processing verticals like oleochemical, petrochemicals demand highly advanced vacuum technology, as these sectors are mainly characterized by challenging operating environment. Mostly what has been observed from past five years trends, chemical companies mainly deploy dry vacuum pumps that can be utilized for a broad range of processes. Some of the chemical giants are also inclining toward vacuum pumps that not only ensure flexibility, reliability, and efficacy, but also feature minimum maintenance and set up. Ergo, it can be said that chemical processing sector would prove to be a viable growth avenue for vacuum pump industry in the years ahead, in terms of new opportunities and product innovations. Geographically, Asia Pacific exhibits a strong contendership in the global landscape becoming one of the top-notch investment spots for industry players. The extensive proliferation of chemical processing sector in this belt can be a cited as a major factor propelling the regional demand. In fact, estimates suggest, APAC procured nearly 50% of the global vacuum pump industry share in 2017, with China and India at the helm. Reportedly, India is estimated to record a CAGR of 7% over 2018-2025, while China vacuum pump market is forecast to surpass USD 2 billion by 2025. While a vast application spectrum and favorable geographical opportunities underline this business space, lack of proper technical knowhow about how to run the pumps which often leads to machine damage is one of the major challenges in the vacuum pump market growth. However, in a bid to combat these challenges, modern day manufacturers are organizing myriad training programs for the operators to ensure a longer product lifecycle. With increasing investments by manufacturers in these initiatives and approaches, vacuum pump industry undoubtedly would be one of the most opportunistic business spheres to watch unfold. 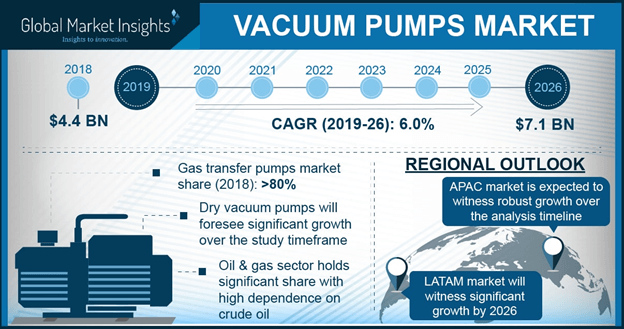 Speaking of the commercialization potential of the entire business space, Global Market Insights, Inc., forecasts overall vacuum pump market to exceed a valuation of USD 6.5 billion by 2025. This entry was posted in Uncategorized and tagged APAC Vacuum Pump Market, Canada Vacuum Pump Market, Europe Vacuum Pump Market, U.S. Vacuum Pump Market, Vacuum Pump industry, Vacuum Pump industry Analysis, Vacuum Pump Market, Vacuum Pump Market 2018, Vacuum Pump Market 2025, Vacuum Pump Market Application, Vacuum Pump Market forecast, Vacuum Pump Market growth, Vacuum Pump Market outlook, Vacuum Pump Market PDF, Vacuum Pump Market report, Vacuum Pump Market share, Vacuum Pump Market size, Vacuum Pump Market trends, Vacuum Pump Market USA, Vacuum Pumps Market.